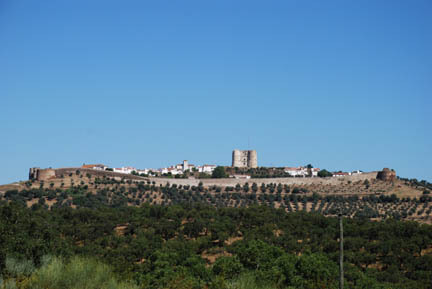 We left Évora on Wednesday and headed for Brangaça in northern Portugal. It made a nice one-day run on mostly two-lane roads. Europe is amazing to Americans. One drives along, comes around a hill and there on the next hill is a walled town with a thousand year old castle sticking up out of the middle. These are scattered around the countryside like we have volcanoes at home. They are so normal that I'm sure the locals don't even give them a second glance. Jose Canico had called ahead and told one of his motorcycling friends that we would be in town. He in turn called a couple of more friends and they met us at the cafe in the campground for dinner and drinks. We talked until midnight. The staff was turning out lights and locking doors and we took the hint and shut up and left. 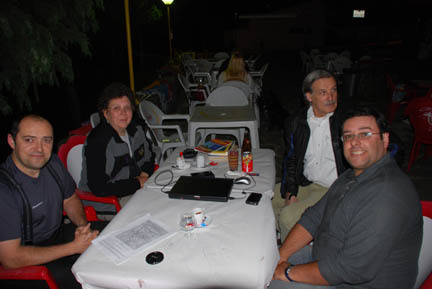 From left to right that is Paulo, Kathy, João and José. The next morning found us headed up the Portuguese side of the National park and down the Spanish side. It was greener and much more forested on the Spanish (north) side, and the road was windier. 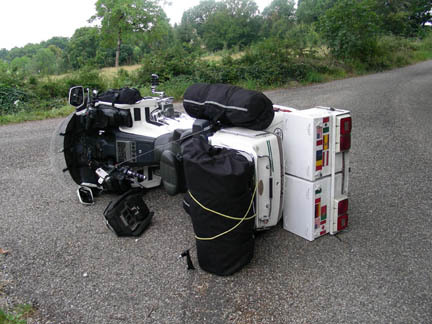 It was built for motorcycles, even one as overloaded and top-heavy as ours. We went on to a planned campsite, but couldn't find it. So we kept going , the next campsite was closed, permanently. 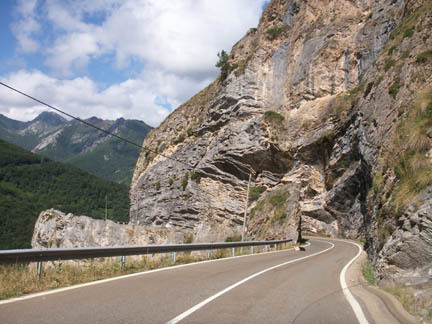 So we kept going, this time into the mountains of the Picos de Europa. We finally found a campground on a windy ridge with low clouds threatening rain. The next morning we woke up to this! This was the view from the windy ridge with low clouds we had camped on. It was fantastic. From here we continued north and over the ridge. The road up had been made of gentle curves through wide green valleys. The road down was steep, narrow and in a canyon, At times the road was not over 15 feet wide, the whole road. The canyon at the point was about 25 feet wide with a rushing stream in the other 10 feet. But it still had a stripe down the middle! As if a car could fit on one side of it! The occasional truck or tour bus took the whole thing. In this picture the black & white thing in the road is a full grown goat. I hope he moved before the bus got there, he didn't move for us. At another place there was a herd of pigs living in a turnout. There were 3 or 4 adults and a lot of piglets. Someone had spread hay and they were rooting and resting in it. These are barnyard pigs, not wild ones. 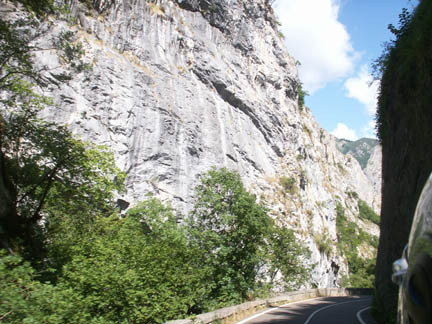 In general the road wound along sheer cliffs and through deep canyons for several hours. 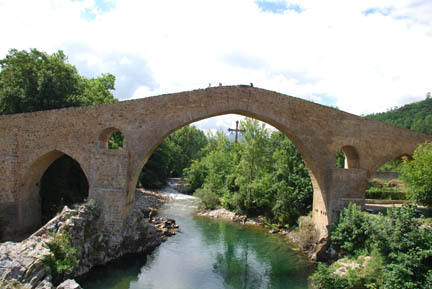 Finally it ended in a town with a Roman Bridge that is still in use, but only for pedestrians. That night we camped in a small town near the Atlantic coast to the east of the Picos. It was a small, but crowded place. We found that surprising because it was right next to a dairy farm. The night we were there the wind was blowing from us to it, thank goodness, but what was it like when the wind turned around. 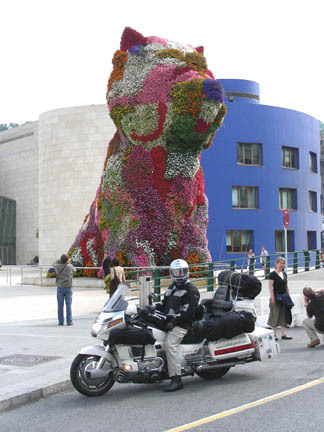 From there we went to Bilboa and the Guggenheim Museum, not to go inside but to see the famous huge flower-covered puppy dog in front. We made a couple wrong turns (we were following the GPS, but it did get us to the building, even if it was the back door) when I ignored it, we soon found the puppy in all its glory. From there we took the fast (toll) road and head for France and the MotoCamp Dordogne, a two wheeled only campground, for a couple nights. The campground is a bit in the back of nowhere (no cell phone coverage! ), but it is popular. 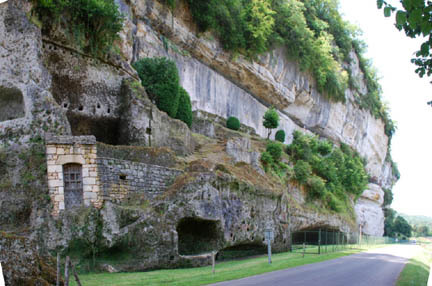 We chose it because it was motos only and was near the Cro-Magnon caves of Lascaux and other sites. The next day we left the gear in the campground and went and looked at replicas of cave paintings. They have duplicated the cave in an underground vault using concrete and other stuff. The paintings were done with the original type of pigments and tools. It took eleven years to build. They have done a good job and they look realistic. The real site was closed 25 years ago because of contamination by the visitors. 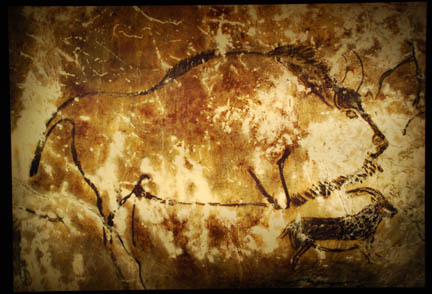 The added heat (body and breath) and the mold spores the visitors brought in were ruining the 17,000 year old paintings. We also went by, but didn't enter, a cliff dwelling site that had been habited since the middle ages until the modern age. This was a community that had used the ledge for defense and lived in and at the base of it. There was only one staircase up and was easily defended. The flat, smooth wall is under the defense space with the overhang above it. What looks like a narrow line is actually a recessed area big and tall enough to live in. The gate and wall are where the original steps start up and then switchback up farther. About a half kilometer of the cliff had houses either on, in or at the base of it. We left the biker campground and headed east on some very small roads. In general France is different than Spain and Portugal. 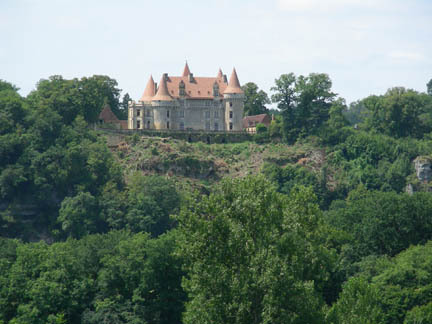 When you come around a curve in the road it is not a castle on the hill it is a chateau! But when it comes to an intersection of the little one-lane roads, one should either make up their mind quickly or put their foot down firmly. As you can see, I did neither. I was looking at the GPS, checking for traffic and going too slow to stay upright. I couldn't decide which way to go and we were at a standstill, as I put my foot down it hit gravel and slid enough that we overbalanced and fell. No damage, just a job picking it back up!!! We had a delightful time on small French roads for two days. We drove through small towns and delightful valleys. This town was holding a market day on its main street. We drove through the middle of it! When we got to the other end we saw a "Road Closed" (or that is what we assume it said, it was in French of course) sign for the oncoming traffic, but we had not seen one at the end we came from. One day it poured rain and we found a campground and hid out for the day. Another day we hunted out a Honda motorcycle shop. Our battery was not holding a charge and we had to buy a new one. 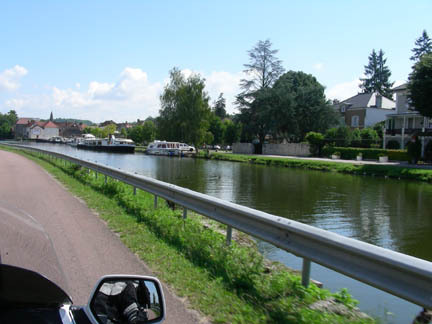 On another day we traveled for miles beside one of the famous French canals, looking at the boats and the locks as we drove along. Eventually we made it to Frankfurt where we again met with Klaus at his store, the Zubehor-Shop-Frankfurt. He sells clothing, boots, helmets (we bought our new ones here last year) and parts for motorcycles. 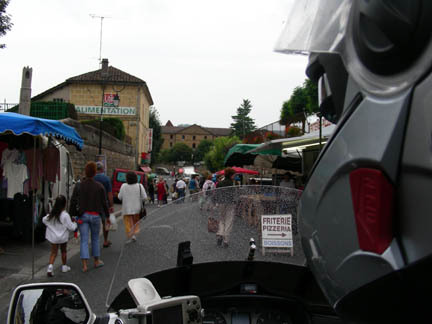 We were there to get the upgraded programming for the Bluetooth communication in our helmets. Besides being the expert for the helmets he is a great guy and helps foreigners from America solve their problems. We had new brakes installed before leaving the USA. After three trips through the very hilly Douro Valley with the Portuguese club, a trip through the Picos de Europa and other hills and mountains, our brakes were worn out. Much earlier than would have happened at home. We had metal to metal contact on the front brake, the most important one. So Klaus ordered new brake pads for us and loaned us space and tools to do the install ourselves when they arrived. It is not difficult and I've done it before. But without access to my shop and tools I was left with hiring it done at a Honda shop until Klaus helped us. We spent three nights at the City Camp Frankfurt. An older campground with a grumpy host, but it is very convenient to Frankfurt, either by vehicle or by U-bahn (commuter train). On our last night we had a couple from Leavenworth, Washington camp next to us. They were backpacking their way through Europe for several months. We shared some beer and wine and talked late. The next day (Sunday) we left headed north to a GoldWing shop we had heard about and that was right on our path north. After about an hour on the road it started to RAIN!!!. The 60% chance of light rain was actually a 100% chance of heavy rain. After three hours we arrived at our intended campground and they have an apartment. We don't have to set up the tent in the RAIN!!! The apartment is twice the price of a tent site, but it has heat and indoor plumbing, neither of which our tent has. We hung wet gear on every hook and protuberance to dry. On Monday we went to the "largest GoldWing shop in Europe", Biker's Point in Uslar, Germany, and had a new rear tire installed. We have gotten a large star shaped cut in the tread of the rear tire. It is just in the tread but it makes me very nervous to ride on it. The steady rain has turned to showers, and it is supposed to get better as the week goes on. On Tuesday we headed north again. The country has flattened out a lot. We had been riding through hills and valleys that reminded us a lot of the Willamette Valley and the Coast Range back home. Tree covered hills and farming valleys. It is just the buildings and signs are different. 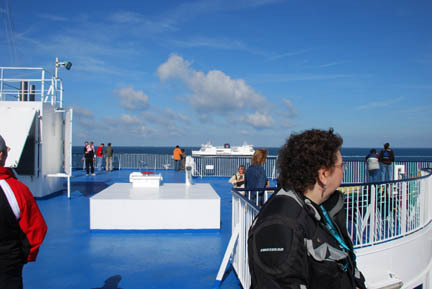 We approached the border late in the afternoon and decided to camp before getting onto the ferry to Denmark. The next day we arrived at the dock and were about the last vehicle to get on the ferry. We were still securing the bike when it started to move, and about 5 or 6 of the cars had their alarms go off. It made a terrible racket echoing around inside that metal boat. That afternoon we arrived at Wing Ding Europe and set up camp for the duration.